Note: This article is based on chapter 1 of my white paper titled 7 Key CBTC Functions Transit Operators Must Understand. Downloaded it here. In my last post I wrote about train recovery and listed three possible methods to recover a failed CBTC train. The first method (TPR) was discussed in the last post, the next two methods (train coupling and fallback mode) are discussed here. Two components to coupling CBTC trains include the physical act of coupling and the logical process of coupling. Coupled trains are tracked as single trains and are protected as such. 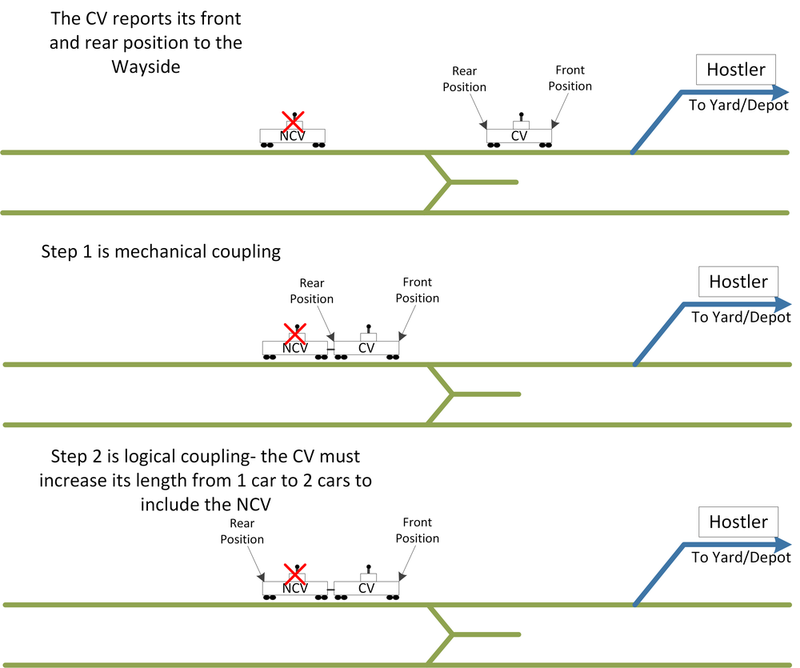 During the act of coupling with an NCV, the VC on the CV train must extend its position envelop to include the extra cars introduced by the NCV (Figure 1). In the above example, the CV train extended its position envelope by moving the rear reported position a full car length to include the NCV. The wayside will receive the new position report allowing it to protect the train. The logical coupling process is critical because the safety distance between trains is based on the rear of the CV (Figure 2). If the CV does not extend the rear position to include the NCV, the NCV is not protected. Train recovery involves a CV coupling with the NCV and towing it back to the yard under protection of the CV train (Figure 3). The advantage of coupling is that Service can begin immediately after the CV starts to tow the NCV. There is no need to wait for the train to reach its destination as is the case with the TPR. The disadvantage is the complicated design. The CBTC system must consider characteristics of the new train (e.g., length of the coupled train, Emergency Brake Rate (EB) rate, service brake rate, jerk rate, acceleration) which is not an easy task. Sending a rescue train to recover an NCV during rush hour is also a difficult task. If the number of train types is kept to a bare minimum, preferably one, the number of coupled train combinations the design must consider is reduced; simplifying the solution. The design may be the purview of the Supplier but complicating the design does not serve the Operator. If the Supplier is not able to produce a stable design, the function may never stabilize or mature and it is the Operator who suffers in the end. Fallback mode of operation is the third and most expensive option. This option allows a failed train to travel, unaided unlike the previous two options, using conventional signalling rules to its final destination. Under normal operating conditions, all trains will operate under CBTC signalling rules. If a train fails, that train will operate under conventional signalling rules (Figure 4). Since the NCV is not communicating its position, the wayside will use secondary detection devices (SDD) to track the NCV. The following CV trains will operate under CBTC signalling rules while maintaining a one block separation from the NCV in front (Figure 5). The time it takes to recognize the problem and change to manual mode (non CBTC mode) and start moving. Speed limitations imposed on non CBTC trains by the Operator. Greater separation between trains imposed by the fallback mode (conventional signalling). Its disadvantage is its complicated design, increased capital cost, greater maintenance requirements and reduced reliability due to extra trackside equipment (signals, track circuits or axle counters, trip stops). The decision to implement a fallback mode must be weighed carefully between the operational requirement and the cost to implement and maintain the solution. 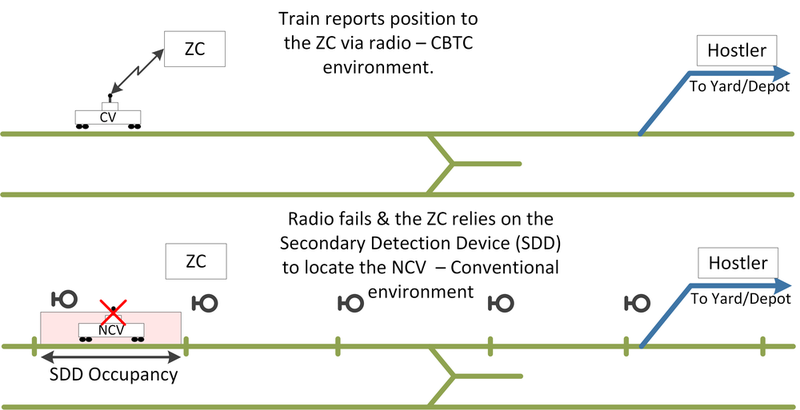 A stranded train is a rare event due to the built-in redundancy all CBTC solutions provide: redundant network design, redundant radios on the trains, overlapping radio coverage and hot standby VCs. But in the rare instance when a train is stranded, the Operator must have a train recovery strategy otherwise the impact to operations is severe. The TPR is a basic train recovery tool that will serve the majority of Operators in the event of a failure. The disadvantage is that other trains cannot travel within this area until the NCV reaches its destination. Train coupling solves the problem of a long one-train-only corridor; however, trying to get a rescue train in the middle of rush hour to a failed train would be a challenge. Coupling requires a limited number of train types and the complicated design costs more to implement. Fallback mode is operationally the preferred method because the impact to operations is lower when compared to the first two options but from a capital and maintenance cost perspective, it is very expensive and not recommended. The train recovery requirement must be based on a firm understanding of the operational need; otherwise an over-engineered and expensive solution such as fallback mode will be implemented.